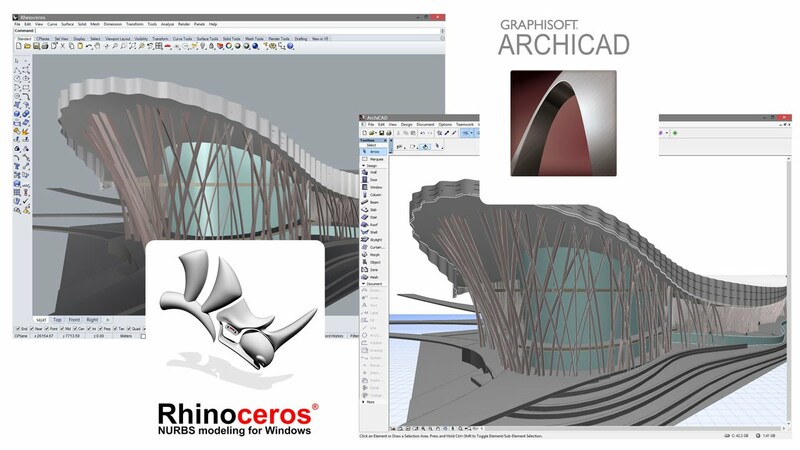 Rhinoceros and Grasshopper - developed by Robert McNeel & Associates - are considered market leaders in industrial design modeling and algorithmic design. Now, designers have various options to connect ARCHICAD's professional BIM work environment with the modeling power of Rhino and Grasshopper. Before installing any connections, make sure that ARCHICAD, Rhinoceros3D and Grasshopper is installed on your computer. On macOS both v21 and v22 of Grasshopper - ARCHICAD Live Connection supports Rhino5. They don't support Rhino6 WIP. Rhino 6 format is not supported in the built in Rhinoceros Import/Export function in ARCHICAD 22. From ARCHICAD 20 on these Add-Ons are part of the ARCHICAD package. In ARCHICAD 19 and 18 install these free Add-ons to enable ARCHICAD to import and export models using Rhino's native (.3dm) file format. Rhino Importer Add-on enables ARCHICAD users on both the Mac and Windows platforms to pass on the model or part of the model produced in Rhino to ARCHICAD. This Add-on, available for ARCHICAD 18 and 19, enables you to open or merge native Rhino (*.3dm) files directly in ARCHICAD. Rhino Exporter Add-on enables ARCHICAD users on both the Mac and Windows platforms to pass on the model or part of the model produced in ARHICAD to Rhino. This Add-on, available for ARCHICAD 18 and 19, enables you to save the ARCHICAD 3D model as a Rhino file (*.3DM). Install these free plug-ins to convert Rhino models to native ARCHICAD GDL elements - standalone objects (.gsm) or library containers (.lcf). Please watch this video to find out more about how to install the necessary plug-ins, and how to import a model created in Rhinoceros into ARCHICAD as native GSM objects. The video first presents the "Single Object Import" workflow using.gsm files and then the "Complex Structure Import" using .lcf files. Download and launch this "GSM-LCF exporter for Rhino 5" Rhino plug-in to be able to save/export Rhino models. Use this workflow to import small-sized single objects or groups of small objects saved in GSM format to ARCHICAD. In Rhino, select the model or its parts you want to export and save them as GSM Object File using the "GSM-LCF Exporter for Rhino 5" plug-in. Go to File/Save or File/Export Selected and in the upcoming dialog choose the "ARCHICAD GDL Object" file type (extension .gsm). In ARCHICAD, add the object to the Embedded Library, then place it into the ARCHICAD project as an Object. Use this workflow for larger and complex Rhino models to convert them into a set of (smaller) GDL objects. This process enables the user to retain separate logical parts within the same model while providing a functionality to monitor and easily update the imported Rhino models in ARCHICAD. The LCF option is also advised to enable ARCHICAD's performance optimization algorithm to work seamlessly on an imported large Rhino model. In Rhino, select the object(s) you want to export as a reference model to ARCHICAD. Go to File/Save or File/Export Selected and save them as LCF Container File using the "GSM-LCF Exporter for Rhino 5" plug-in. In the upcoming dialog choose the "ARCHICAD GDL Object Library" file type (extension .lcf). In ARCHICAD, add the LCF file as a Linked Library in Library Manager, then place it into the ARCHICAD project as an Object. Using the "Rhino LCF Observer" Add-On you can place all objects from the LCF files, and/or to update any placed instances as needed.